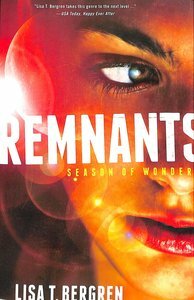 In the first novel of this YA futuristic/dystopian series by Lisa T. Bergren, gifted teens known as Remnants have been chosen and trained to act as humanity's last hope to rectify the horrors that are part of everyday life in 2095. The Community trained these teens as warriors and assigned them Knights of the Last Order as protectors; together they are a force that will be difficult to bring down. The Sons of Sheol are determined to do just that. About "Season of Wonder (#01 in The Remnants Series)"
Customer Reviews For "Season of Wonder (#01 in The Remnants Series)"
I love this book so much that I have read it 2 times, and am planning to read it many more times. It is a really exciting book filled with action, drama and a bit of romance.